Hi guys! It's time for another ABC Challenge. And here is our theme: K is for Keep It Simple (we want to see Clean & Simple creations). I love cats, so this cute digi image was definitely my stile and I really want to keep it simple so I just added a sentiment ... I think it can't get any simpler than this, don't you think? Our sponsor is Oak Pond Creations. I hope you'll join us at ABC Challenge and don't forget to have a peak at other beautiful creations from our designer team. Awwww such an adorable image coloured so beautifully and I love your CAS design. I love the paper piecing on this cute card. Your coloring is beautiful and this sweet card will brighten someone's day! Prisrčna muca in lepa barvna kombinacija! Prekrasna. Jako mi se sviđa. Krasna, nagajiva mucka. Lepa voščilnica. 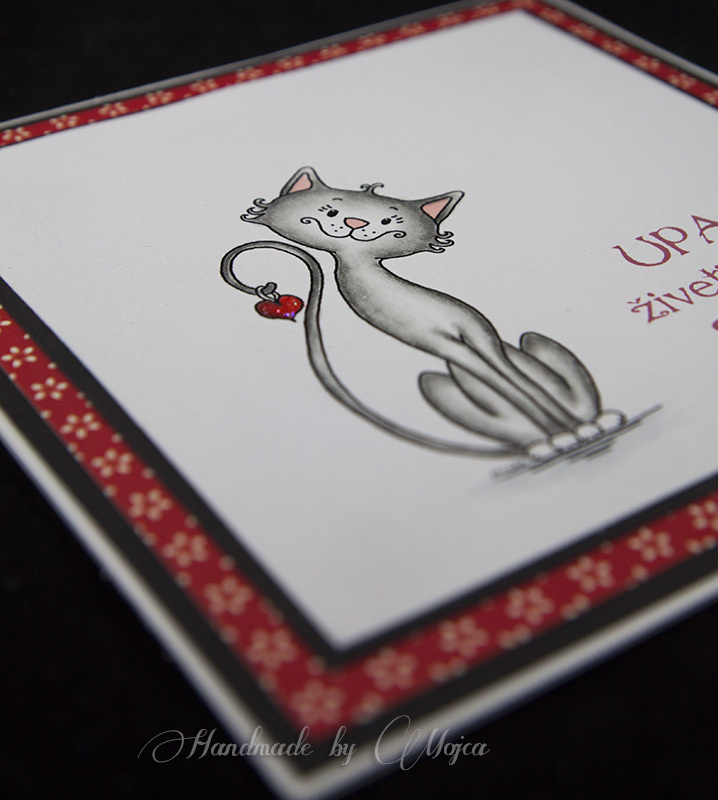 Love your C&S card and the kitty is really cute. Love it. Sometimes you don't need to go all fussy and the C&S style is perfect for the image. You've definitely cracked it! This is so sweet !!!! Gorgeous stamp and fab colouring love it! Prisrčna mačkica in čudovita voščilnica. Oh kako kjut mucka! In napis odlično paše zraven, super je vse! This is gorgeous Mojca. Love the colour combination and you have coloured the image perfectly. Great layout. iii. kakšna super cute mačka in skupaj z napisom tvorita krasno celoto. Zelo lepo pobarvano in narejeno.